The use of social media is not all about marketing per se. It is also about reaching people to share views and impact opinions. In that respect, it is not just social marketing, it is also about social corporate communications and public relations. Several news items involving Pope Francis and President Obama over the last week showcase the smart use of social media to share views, impact opinions and reach people in new ways–beyond relying on traditional media relations. They also underscore the need to integrate social media strategies into PR and corporate communications strategies rather than treating social media as a simple add-on tactic. 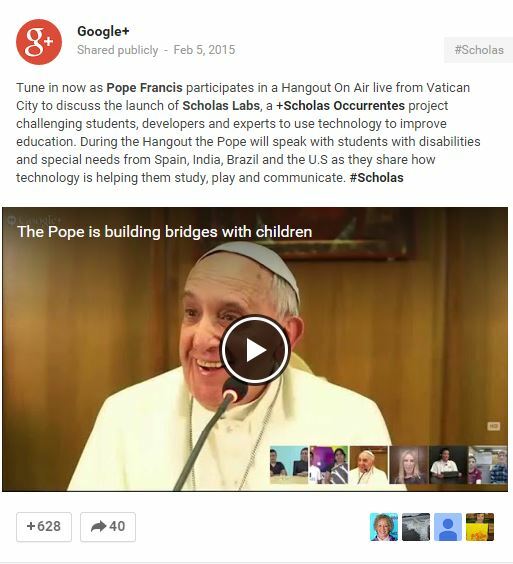 The Pope: The Pope used Google’s Hangouts to discuss the launch of Scholas Labs and Scholas Occurrentes — projects challenging students, developers and experts to use technology to improve education. B.L Ochman points out that he used this venue to connect directly with students with disabilities and special needs from Spain, India, Brazil and the U.S, to discuss how technology is helping them study, play and communicate. While BL Ochman talks about the technology and use of hangouts going mainstream, I think the other side of that coin is that Pope used Google Hangouts to connect across several countries (multinational in nature), as well as to connect directly with a very specific and targeted audience. In doing so, he by-passed the need to use traditional mass media. Social media tools connected him in a global context with the community that is directly associated with this initiative. The President and White House Communications: The other items in the news related to President Obama and the White House Communications efforts. Perhaps my interest here is because of a previous career in politics. However, I often think that political communications is often more sophisticated than business. That’s because in politics, votes are the products and you only get them if you communicate and deliver. I have often thought that business could learn alot from political communications — from aspect such as storytelling, highlighting people in speeches and the focus on constituent groups and connections with them. Clearly, the Obama team are no novices when it comes to using social media electorally as many a case study and write up have shown. In that respect, they not only used used social media effectively, they also applied data better than most businesses do today in terms of targeting and follow through. Experimentation, integration and adoption are the key words above. That implies going beyond simply undertaking some social media tactic tied to the communications plan. Look at the smart and savvy use of social media in and around the State of the Union Address. As my good friend David Armano noted on Medium, the White House continues to reach people where they are versus just relying on traditional media coverage. In the past reaching people where they were meant going around the national/DC press to do local newspaper, TV news and radio. Today, it means connecting on YouTube and Twitter and finding a way into your social media stream. The Impact of Social Communications: Dan Pfeiffer notes in a another New York Times story, “To not have an aggressive social media strategy in 2015 would be the equivalent of not having an aggressive TV strategy in the 1950s.” In that same New York Times story, the Whitehouse officials also noted that their use of social media to communicate was having results in how they connect with their stakeholders. “The results have caught the attention of the president’s most senior advisers, who are increasingly turning to the digital team for guidance on how technology can help Mr. Obama better connect with the public, officials said. “Not only have the digital tools become more important in communications generally, but the people in the building want it more and are asking for it,” said Kori Schulman, the director of online engagement. In addition to previewing much of the State of the Union address using special events and social media, as the State of the Union address was being made, simultaneously the Whitehouse staff tweeted relevant topics and stats with visuals. That is orchestrated in a way that appears to have garnered engagement, retweets, not to mention they successfully managed the news cycle in a way that out-performed the Republican opposition. In a conversation with Jim Rudden, CMO of Spredfast he noted that the Whitehouse “managed and extended its news coverage” for the State of the Union address through social media (and as measured by Spredfast’s Analytics tools ) completely dominating conversations and coverage of the Speech. The Emerging Media Outlets Gain More Credibility: But it is not just about the smart and strategic use of social media tools that point to a savvy adoption and integration of social media into the Whitehouse’s communications efforts. This week two of the “new media outlets” (Vox and Buzzfeed – new news outlets mentioned in a previous post here) had their first interviews with the President. The New York Times noted that Buzzfeed and Vox are now recognized as serious news publications. As might be expected, Vox media’s interview with Obama was previewed with a video clip and infographics on Facebook over the weekend. By Sunday evening, the video had already been viewed more than 320,000 times. Go check out both the Vox transcripts and videos…it is quite interesting in how it has been put together and presented. The infographics, context and more. Masterful actually. Vox or Buzzfeed’s format may not be what PR pros are familiar with. Buzzfeed has asked its readers about questions they want put to the President. 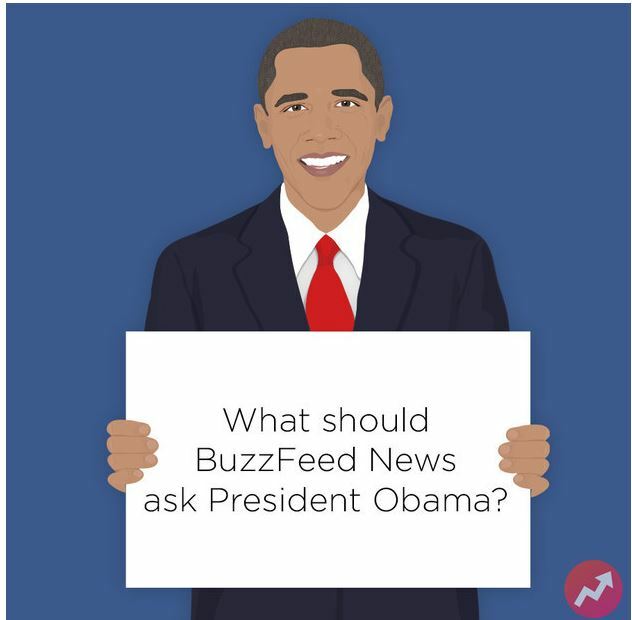 While you can submit questions via email, Buzzfeed also suggests sending in questions visually on Facebook, Snapchat, Instagram, Twitter, or Tumblr. Of course, what would a Buzzfeed story be without some video and The President will also participate in a video with BuzzFeed Motion Pictures — shared exclusively to Facebook. Social media opens up a plethora of new ways to communicate and those new opportunities deliver to you different and differentiated communications and connection. Integration of social media and consideration of how to strategically use the different tools available to you is critical to smart Communications in today’s social and media environment. The Whitehouse media properties are tightly integrated and very social. Are your company’s? Is your website newsroom shareable and up to date in terms of its appearance and operation? Take a look at the Vox interview on the Web. Also take a look at the films and the visuals. Its an interesting presentation. Have you pre-briefed key business bloggers on an impending announcement? Do you use your company blog or influencers blogs for company announcements? Have you pre-released a transcript of an announcement on social platforms at the same time as you wait for that news coverage? Have you segmented your key audiences and identified the best places to connect with them in social media? Do you get a daily social media report about your key issues/industry issues/competitors to know where and who are discussing things on social media? Are your prepared to have your CEO in a new social media interview? Do they understand the benefits and some of the differences in form and content and expectation? Have you integrated visual assets into Tweets and other company news? Do you have a visual news strategy? Do you have a team in place or response mechanisms to interact and engage with people who share your news or engage with it in some way? As a follow up: The Buzzfeed Video, in a little over 24 hours, had accrued a total of over 23 million views, 600,000 likes, and 40,000 comments. It was also picked up by major news and media outlets worldwide including CNN, Rolling Stone Magazine, the Guardian and the Wall Street Journal. On February 16 it was sitting at 44 million views. Richard: Thanks for including me in this most insighful post! Your Lessons Learned list should be required reading for everyone in any area of communications. While Pope Francis has called the Internet “a gift from God,” he also admitted that he doesn’t know how to use a computer. He has a Twitter account with nearly 6 million followers and he’s said that others post the Tweets for him. The White House has been using Hangouts for the past couple of years and using cutting edge technology has, as you note, given them access to new audiences who now ignore traditional media. The job they did with the State of the Union was nothing short of masterful. Brands, agencies and marketers of all stripes have much to learn from these leaders.